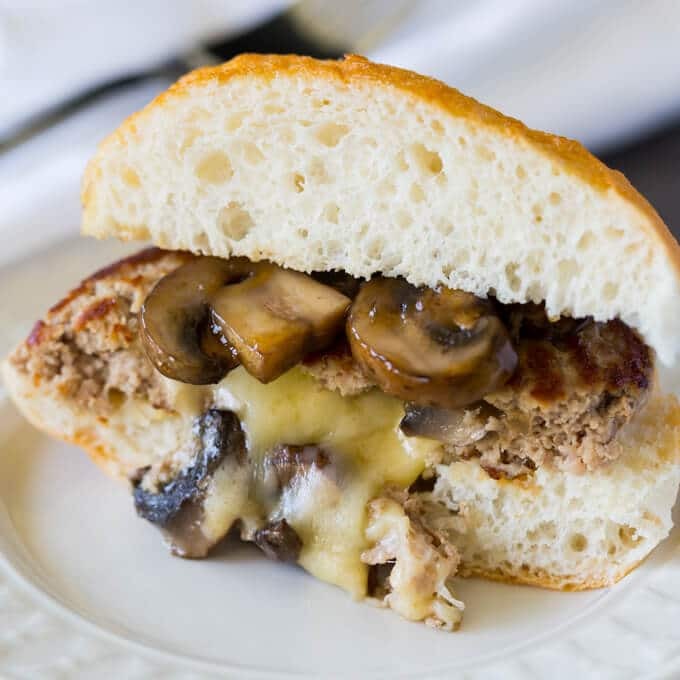 Make a classic mushroom and swiss burger using ground turkey! 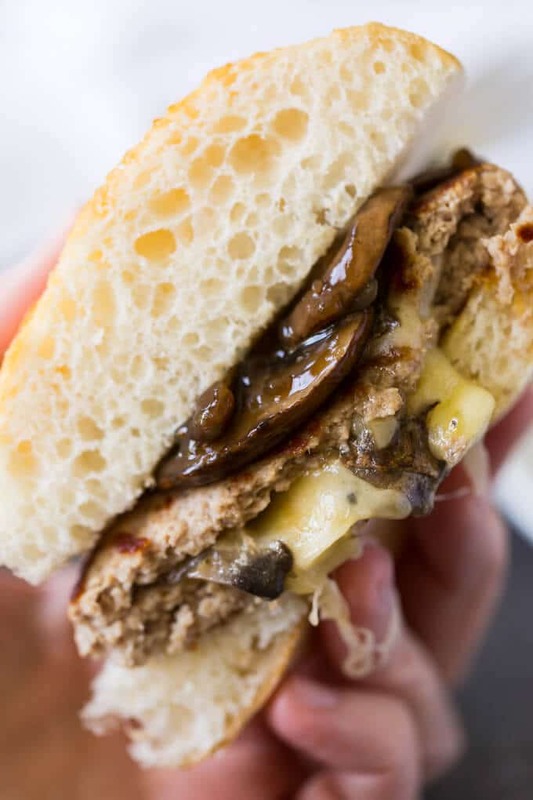 These stuffed turkey burgers are packed with portobello mushrooms and melted swiss cheese. This recipe was sponsored by PAM Spray Pumps. All opinions are my own. Who invented the mushroom and Swiss burger? An hour spent scouring the interwebs left me none the wiser. Whoever they were, they remain an unheralded genius. 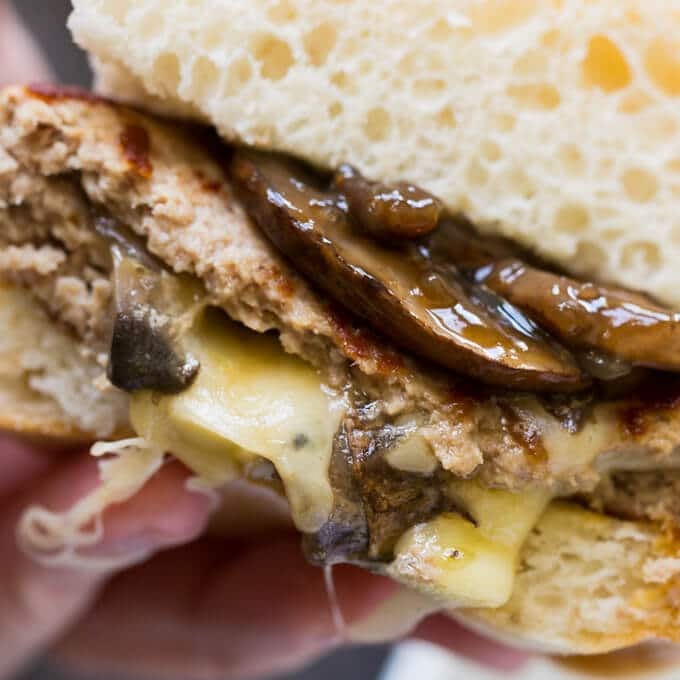 A mushroom and Swiss burger consists of a beef burger patty topped with melted Swiss cheese and sautéed mushrooms—this is crucial—in a rich mushroom gravy. 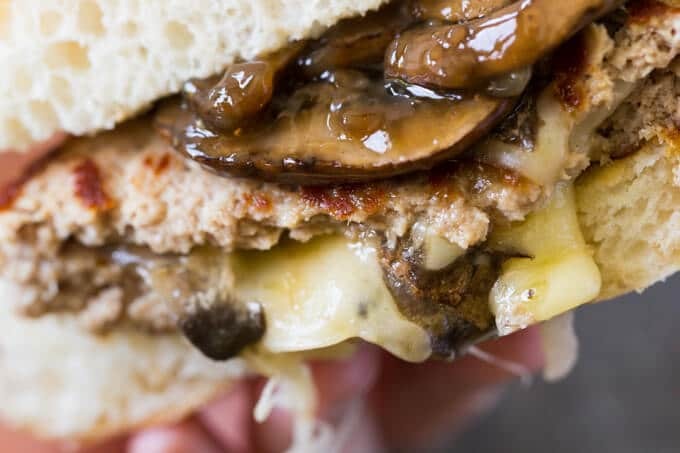 Being the adventurous sort who loves nothing better than a kitchen challenge, I decided to see if I could make a turkey burger version of the mushroom Swiss burger. Even better, I would stuff the inside of the burger! Behold, the world’s best Mushroom and Swiss Stuffed Turkey Burgers! Since ground turkey can be a bit drier than ground beef, I’m using a PAM Spray Pumps to lightly oil the skillet before cooking. It’s actually similar to what I do with lean burgers made from ground bison. 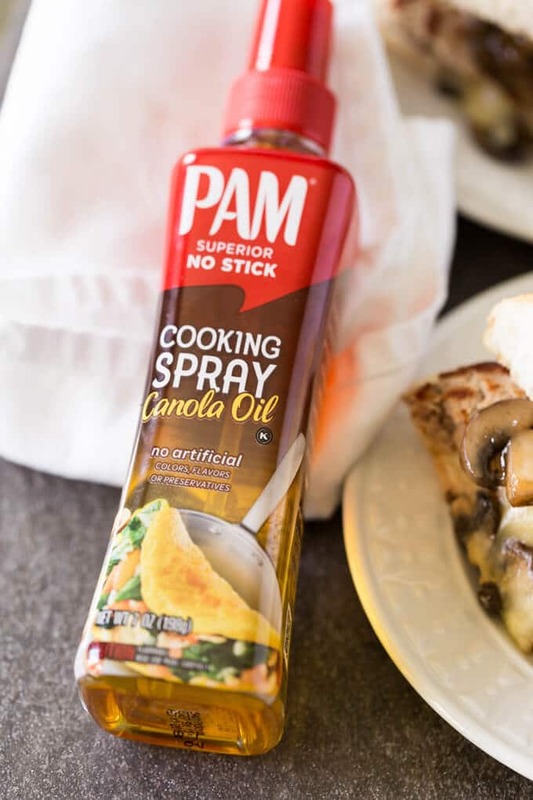 PAM Spray Pumps come in two varieties—Canola Oil and Olive Oil—and have only three ingredients (oil, alcohol, and soy lecithin). With PAM, it’s easy to control how much you use. Lean ground turkey + PAM = less added fat and calories. It’s a win all around. You can actually swap in different types of cheese, or mix cheeses, if you prefer. Try a nice English cheddar, or mix Swiss with Colby Jack. Spritz a pan skillet lightly with PAM before heating on the stove top at medium low heat. Add the sliced mushrooms and cook until tender, about 8 minutes. Add 1/2 cup of beef broth to the pan. In small bowl, whisk the cornstarch with a tablespoon of beef broth until a very smooth liquid is formed (no lumps!). Add the cornstarch liquid to the pan, then stir and cook on low for about 2 minutes until the gravy thickens and becomes glossy. Split the finished mushrooms and gravy in half, into two separate bowls: one for filling the inside of the burgers, and one to be set aside for topping the finished burgers. Fold each slice of Swiss in half, then fold in half again, making each slice into a thick square-shaped stack of Swiss. 4 slices of cheese = 4 stacks. Divide the pound of turkey into 8 equal parts. For each burger, flatten 2 parts into separate patties. Top one patty with a spoonful of mushrooms with gravy and place a Swiss cheese stack on top. Gently cover the first patty with the second patty and pinch the edges to seal, tamping gently to even out the thickness. 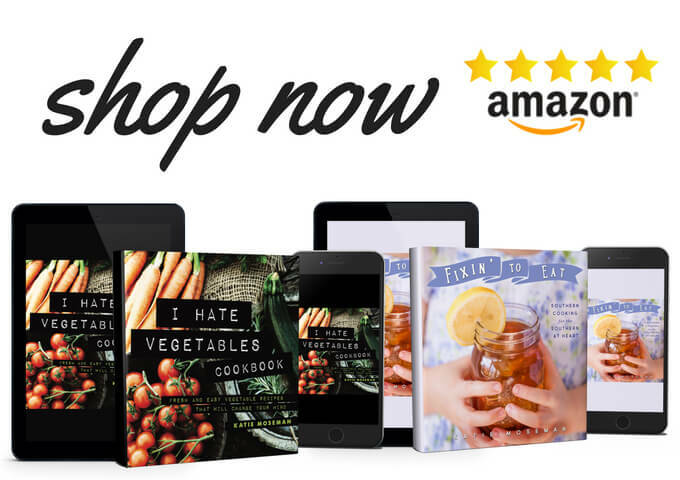 Repeat until you have 4 stuffed turkey burgers ready to cook. 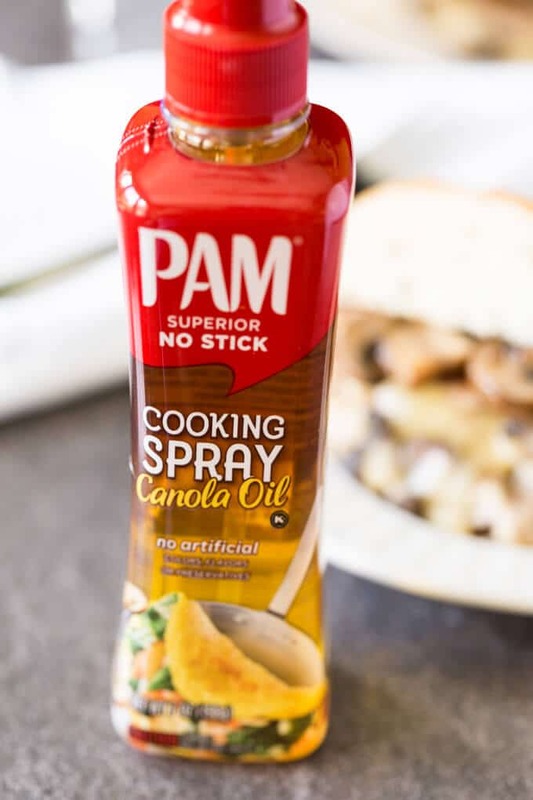 Spritz a skillet with PAM. Heat the skillet to medium heat. Cook the burgers in the skillet for about 5 minutes on each side or until the meat reaches 165 F. If the pan begins to get too hot, reduce the heat slightly. Serve on buns and top with the mushrooms and gravy that you set aside earlier. 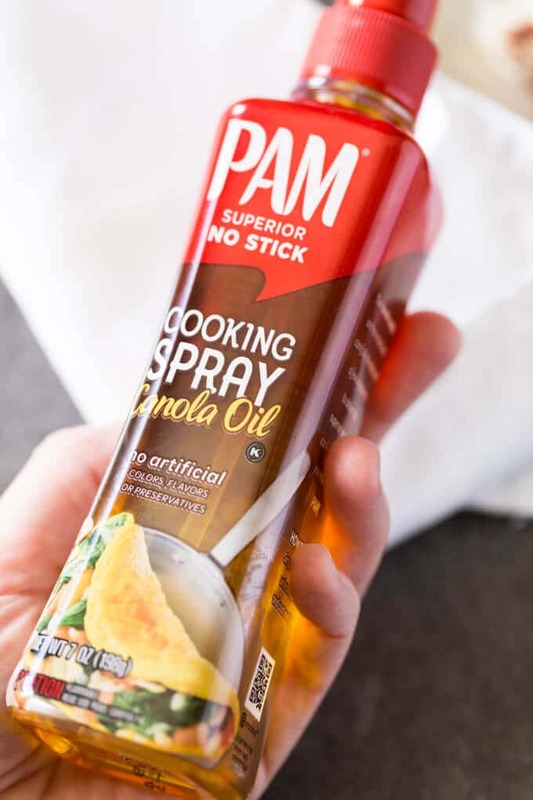 Look for the PAM clear, non-aerosol bottle on your next grocery trip. The melted cheese and mushroom gravy look so yummy!